Both Fixed & Running Rigs Can Catch Carp. But Make Sure They're Safe! There are two basic ways to set up a lead weight on end tackle, either a fixed type or a running rig system. The lead clips that are used by so many anglers today are classed as fixed, as well as many inline rig set ups. The swivel type leads attached to the main line using a big, loose, plastic rig ring are classed as running rigs. There are different benefits to using both types. Before choosing which type to use, it may be best to think about the type of lakebed you’re fishing on, as well as the time of year. 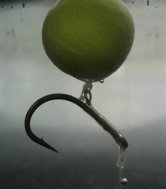 For instance, a fixed lead, especially an inline, would best suit a hard bottom like gravel because the hook link has full weight straight from the lead, so once the bait is picked up and the carp straightens up, it gives a quick bolt effect and sets the hook before the carp suspects anything. In the colder season, carp slow down their movements so a more sensitive bite indication will be required. Thus, a running rig system would be best suited in this situation. Running rigs may also work better on very soft beds as you can still get indication of when the bait has been picked up. A fixed system may bury the lead too far down, and mean a fish has to pull too much weight in order to indicate a bite at the buzzer end. Often a carp can use the heavy weight as leverage to unhook itself without you knowing about it! So improving your bite indications is important for catching bigger fish! A helicopter rig set up may be best to use in soft silt because of the way the lead and hook link are separate. If set up correctly, it allows the lead to sink into the silt without dragging the hook link down with it. It means the lead can be hidden in the silt, while the hook link rests nicely on top of the silt without any tangles or loops in the line.